Thank you for coming to this page it means a lot to me that you were interested enough to do so. 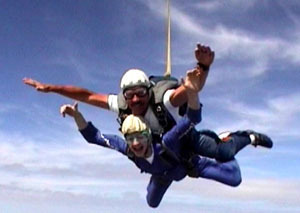 I would have loved to have said that I had done the following parachute jump. My family and I wanted to do something for Megan Armstrong and her family having heard about Megan's plight on the news and browsed thier website. 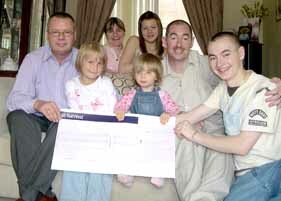 In 2006 we struck up a rapport and pledged to do what something to help raise funds for her cancer appeal fund. I iinitiated some support for the family with some influential friends and colleagues but wanted to do something more personal. 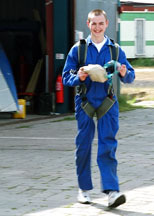 I noticed on the website dedicated to Megan's plight that a sponsored parachute jump was being planned for May. The jump was being organised via the Peterlee Parachute Centre, a centre where I had done my own sponsored parachute jump back in 1988 which was coincidentally for the "Cancer Research Fund". I could vividly recall the adrenalin rush of my jump and thought it something I would be able to enjoy doing again. The downside is that since my jump, my health has been a bit of a roller coaster ride and I had now turned 40. This meant that I had to get medical clearance in order to take part. I knew it might prove difficult but hoped I might scrape through. I was however, disappointed when I was unable to get the neccessary clearance needed so the prospect of doing a parachute jump was no longer a practical reality. Our son Karl, offered to take my place which was quite a surprising revelation as it is absolutely the opposite of his character to do anything like this. He said that as scary as the thought was of doing such a thing, he felt the cause was enough to spur him on. It was not easy decision for him to make and we felt really choked at his courage and compassion for Megan's plight! It has been quite a journey for us all and we both agree that we have each taken something from the experience. The following text is a more detailed report of Karl's endeavours and we hope you find Karl's strength and determination interesting. On the 26th July I was fortunate enough to complete my parachute in aid of the Megan Armstrong Cancer Appeal although it has not been straight forward.The jump was originally planned for Sunday the 13th May, however, with just two days to go the jump the weather took a turn for the worse with some extreme weather including some thunder and lightening storms. 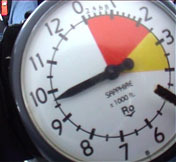 With 24 hours to go I received a telephone call indicating the jump had been cancelled so it was not altogether unexpected. It was left open and I would be informed when a new date was arranged. A little while later I was told that the jump had been rearranged for Sunday the 25th June, giving me something to aim for. Leading up to the 26th the weather seemed once again to be against me doing the jump, but the jump was going ahead. In order to do a Tandem Jump I had to be at the parachute centre for 8:30 am and not sure of what weather or traffic we might get on the way we left Whitby at 6:30 am. It was a really early start and on the way the weather was poor with fog and drizzle, we just hoped it would pass as we made our way to the centre. At the centre the fog had cleared leaving the drizzle and a very murky grey sky in its place. 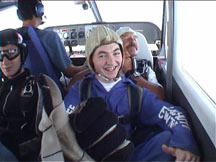 I sat there with other people wanting to do a parachute jump and as the time passed the weather didn't get any better. In the end the centre staff told us that the weather was not good enough for a parachute jump. As we were already at centre we were put through our basic training and given a month in which we had to return to actually do a jump. I was given a date to go back to the parachute centre, which would have seen the third Sunday return. I had only been working in my present job for a few short months and as supportive as they had been, Sundays are perhaps the busiest day of the week for them and I felt asking for a third Sunday off was a little too much too ask! I explained this to the centre and they told me to come back on the 26th July and hoped it would be a case of third time lucky? We experienced some really good weather in the run up to the jump and it looked promising. Doing the training up front meant that I was spared having to be at the centre first thing. On the day in question the sky was filled with a grey cloud base although it remained sunny. We set off in plenty of time and the way there I thought about what I was doing. If anyone had told me a year ago that I was going to do a parachute jump I would have thought them crazy, the very thought of it left me wondering what I was really letting myself in for. It was the very reason for doing the jump that kept going, knowing that it was for such a worthy cause, being able to contribute towards Megan's cancer appeal was something I felt quite proud of and I wanted to do the best I could. We arrived at Peterlee parachute centre with plenty of time to spare, which gave us the opportunity to have a look around the centre and my father the chance to remember his own jump from the same centre. The sky was still filled with quite a bit of cloud and we wondered if the jump was going to go ahead, it seemed that I was not destined to do a jump and it left me feeling anxious. Sometime later one of the centres planes went up with members of the club in order to see assess the cloud base. Eventually five parachutes were spotted and it gave me quite a lift to see that it would soon be me. My name came over the public address system and I knew the time had come for my jump. I made my way into the hanger and was suited up in a jumpsuit with an amusing hat and a weird looking pair of goggles. Here I am all dressed up "Tickets Please". I had taken the option of having my parachute jump videoed and was shadowed by the videographer along the grass to the airplane sat on the runway. The videographer was professional and amusing and he was helpful in relaxing me. The airplane left the ground and although it seemed to take ages for the airplane to reach the desired altitude seen to the left on the altimeter, I was presented with spectacular views spreading far and wide. The aircraft door was slid open and the refreshing breeze was most welcome, the club members present left the plane first and I was asked to shuffle towards the edge of the door. It would be a lie if I said I was not nervous or anxious at what I was doing, but at the same time it was such a thrill. 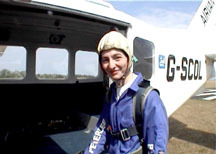 The instructor and I slid forward and before I knew it we were out of the plane free falling, there was no going back now, not that I felt like I would have, the adrenalin rush was simply fantastic! The videographer buzzed around us taking video and still shots with his helmet mounted camera and at times I was distracted looking around feeling quite elated at being so brave. The free fall part of the jump lasted around four or five minutes at which point the chute was deployed. For a brief time we seemed to shoot upwards before stopping then beginning the drop to the ground, hanging below the instructor I could finally marvel at the spectacular 360 views. The videographer left us to make his own descent and although it seemed quite slow our own descent was quite quick. As we approached the ground I thought about what I had been reminded off prior to the jump about my positioning. The videographer was on the ground still videoing us as we made a gentle landing, it had all gone without a hitch just as I was assured it would go, the buzz was fantastic I was proud of what I had achieved and rightly so. Once free of the instructor we gathered the chute and made our way back to the hanger to be debriefed. I was given a certificate to confirm I had completed the jump and along with my family I was invited to have a quick look at what the videographer had captured. It seemed pretty weird looking at the large screen seeing some of the jump and looked forward to receiving the edited version. Once I had thanked all those involved at the centre we made our way home to begin to begin collecting the sponsorship money. Back home, at work and around town I am constantly reliving the parachute jump experience telling the story to anyone who would listen! It was such an exciting experience that I would recommend to anyone more so if it is for a worthy cause; I am not the sort of person who would normally give any consideration to doing something as adventurous as this and I feel confident in saying "if I can do it, so could you." Karl has been fantastic in being able to do the jump and as his parents we are rightly proud of his achievement. We wondered how he would find it and before the jump we shared his anxiety. What we were not prepared for however, was his reaction after the jump! He was elated and smiling and it was such a boost to know he enjoyed the experience as much as he did. 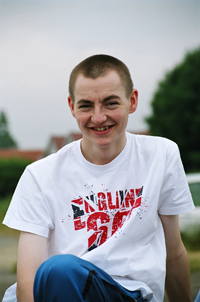 Now that almost all the sponsor money has been collected in we have a better understanding of the final amount and we are happily surprised to see that he managed to raise just over £800 in sponsorship money. 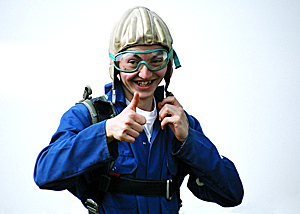 It is usual practice for the person doing the parachute jump to deduct the fee paid to the centre for the jump from the sponsorship, but Karl was reluctant to do so as it would take vital funds away from the cancer appeal! He chose instead to cover the jump fee himslef and did not take anything away from the sponsor money. Karl is rightly proud of himself and has told us that he takes great the satisfaction in helping the cancer appeal and being able to make the parachute jump. All that remains now is for a meeting to be arranged with Megan and her family and we are really looking to meeting with them for the first time, Megan has such strength and courage and she is an inspiration to us all! Karl has asked that I make room here for him to say a big thank you to all those who sponsored him in particular the staff at Masons fruiterer's whose endeavours made a healthy contribution to the amount raised. The staff at the parachute centre were fantastic and made the whole event effortless he would like to add his gratitude to the instructor who had travelled up from Liverpool. Would Karl consider doing another parachute jump, the answer has to be a resounding yes, "James Bond" has nothing on Karl. When asked, Karl said, "The thought of leaving an airplane seems daunting and it is not something to take lightly, however the thrill of the descent is such an adrenalin rush". Karl said, "If he could drive, had more free time, and if the centre were closer he would consider more jumps." 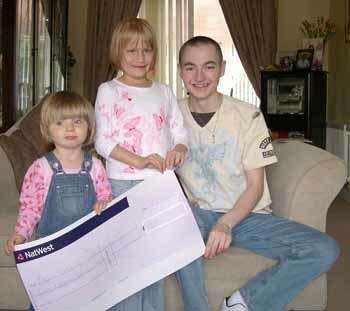 With all the sponsorship money collected in all the remained was to arrange a suitable date and time to go through and finally meet Megan and her family. Travelling through to see them we were all nervous, although Megan knew of our existence she had not met us before nor had we actually spoken to her. We wondered how she might react to people who were effectively strangers and how she might be with us. In the end our concern we needn't have worried as Megan greeted us at the door as though we were visiting family members and this is how it was for the remainder of our visit. We found Megan to be a sweet pretty child and even with all she has experienced she has so much energy she has such an endearing personality. We were touched by how calm she was in a sort of hyperactive way and we marvelled at her character. Megan has a younger sister Kyra who was reluctant to come into the room at first but Karl's sister, Lucy, managed to coax her in and from there on she was a bundle of energy herself. Megan's parents Philip and Sandra must surely have their hands full. Kyra seemed to warm to Lucy and we could tell the feeling was mutual, it is easy to appreciate that both Megan and Kyra have the ability to touch something special in everyone they meet! When the time approached for us to leave we were all very touched that Megan and Kyra commented on us not leaving and coming with us, more so when they had only met us for the first time that day, they made us feel so welcome it was so moving. The return trip home took a little longer possibly as a result of greater traffic numbers but even so Megan and Kyra were the talk of the trip all the way home! It is a shame there is some distance between us, as I know we would all be up for a spot of child minding. We feel quite satisfied that as a family with our problems that we have taken to Megan and feel with conviction that Megan at such a tender age has experienced things no child should have to experince. We share many feelings of affection and hopes for Megan and her family and wish a more secure and healthy future for Megan!